As our readers may recall, the Blishaks are a family of railfans. Ted recalls getting so excited about riding a Pennsylvania Railroad commuter train into Pittsburgh at age 9, that he couldn't eat his breakfast. In a previous story, Ted bought a "Learn to Drive a Locomotive" trip for his brother George's 70th birthday. 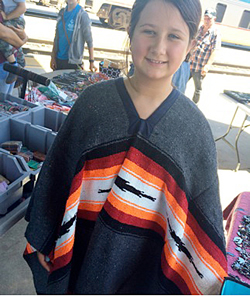 Let's join George now as he invites Granddaughter Lila Lee aged 13, Grandson Johnny, aged 9, and his daughter Anna aboard Amtrak's Southwest Chief from Los Angeles to Chicago. Ted & Sylvia Blishak. 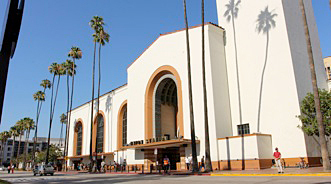 Los Angeles Union Passenger Terminal! Is there a more dramatically beautiful starting point for a transcontinental rail trip? As we entered the high-ceilinged, art-deco hall with its lavish Spanish tile, I recalled the many Hollywood stars who'd added their own glamour to this iconic station—a station which, in its own right, has been featured in movies from the 1930s on. We enjoyed lunch at the Musso and Frank Grill, Hollywood’s oldest restaurant, and a family favorite. 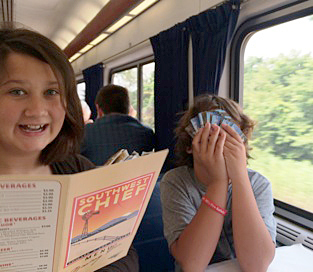 We would have dinner aboard the Southwest Chief, scheduled for a 6:15 PM departure. It was a hot August day in L.A. Upon arrival at the terminal, we were very pleased to be directed, with our luggage, to the recently established Metropolitan Lounge, on an upper level of the building. 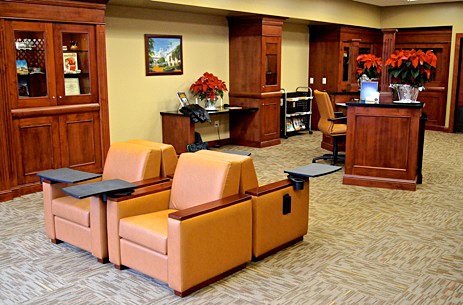 We placed our luggage near the reception desk, selected cold water and soft drinks from the complimentary beverage counter, and settled into our chairs. Not the least of the features of the striking new Metropolitan Lounge are clean and well-maintained restrooms. This is in contrast to the large restrooms in the terminal's main concourse, often overcrowded with hurrying Metrolink passengers, as well as by other Angelinos who wander in and out from nearby neighborhoods. Metropolitan Lounge, the sleeping car passengers' waiting area. As departure time approached, redcaps arrived with electric carts outside the rear of the lounge, where they assisted several passengers in need of their services. The rest of the passengers were alerted to get their luggage and follow the lounge staff member through the front door and into the elevator. I led the long walk to and through the subterranean passageway beneath the train platforms where, on about the next-to-last platform, we spotted a directional sign to the Southwest Chief. Boarding went smoothly. Our travel agent, my brother Ted, had arranged for the four of us to be on the same Superliner sleeper car. I settled into a downstairs roomette. Anna and the kids were delighted to have an upper level bedroom. Our car was directly behind the dining car and sightseer lounge, which would make for conveniently short walks to those cars. Before the train started, Johnny sat down in the bedroom, looked around at his accommodations, and made a remark that would never be heard on an automobile or airline trip. 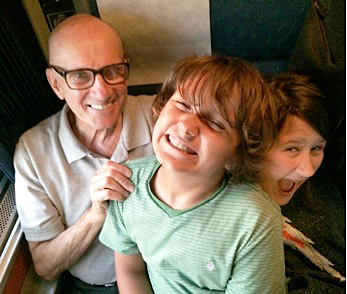 He clasped his hands behind his head, and stated, “This is the life!” The Southwest Chief departed LA exactly on time, and as we rapidly accelerated to 79 mph, Johnny and Lila Lee tried hard to remain calm. I will not fatigue the reader by listing all of them, but the first two stops will give an idea of incidents that can, and sometimes do, lead to late arrivals at Amtrak destinations. As we came to a stop near railroad yards east of downtown L.A., the conductor informed us via the public address system that dispatching in this region was done by Metrolink, a very busy commuter rail system that serves five Southern California counties. The dispatcher stopped our cross-country train for over twenty minutes, after which a Metrolink commuter train of about three cars sped by. The dispatcher then permitted the Southwest Chief to proceed, and we arrived 25 minutes late to the first scheduled stop at Fullerton. The Southwest Chief came to another unscheduled stop after entering Riverside County. This stop lasted much longer than the first. It was caused by a trespasser somewhere on the tracks ahead, resulting in the dispatch of law enforcement officers. We arrived at our second scheduled stop of Riverside well over an hour late. But enough negatives! 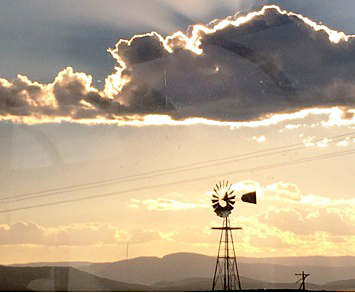 The positive attributes of Amtrak travel are many. An outstandingly competent and very pleasant lady, originally from Wales, was in charge of the dining car. The dining car meals were very good, and the servers were efficient in every way. The wait staff clearly reflected the professional management and training of the Welsh lady. They appeared to enjoy their quite challenging jobs, and that was appreciated by the passengers. Many of the diners were enjoying meeting new people and sharing tables with them as community seating is customary in an Amtrak dining car. However, a number of diners, predominantly males, and sadly, of all ages, were dressed in get-ups that were barely appropriate for a gym workout. I am old enough to remember when men wore coats and ties to the dining car. One disappointing example of 2015 style was a silver-haired man in his early fifties who came shuffling in for dinner, making what he thought were humorous quips to the wait staff. He was clad in shower shoes, baggy short pants, and, to complete the ensemble, a tank top. Johnny took the picture of the New Mexico scene below left. It echoes the theme he observed on the cover of the Southwest Chief's dining car menu above. She reported the issue to the conductor, who took the man aside and apparently read him the “riot act.” To his credit, I noticed that the man was calm, quiet and courteous throughout the remainder of the trip. 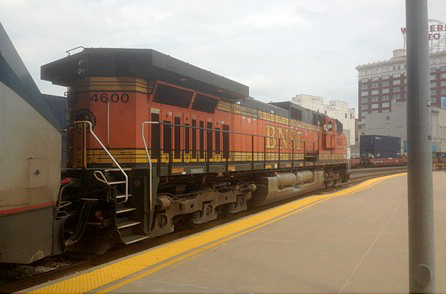 At Kansas City, we were able to take a close look at the BNSF engine that had been coupled to the front of our train during a maintenance stop in Albuquerque. This unit led the train all the way to Chicago, but we did not hear an explanation of why it was done. Johnny’s mother Anna remarked that her son, like many children in his age group, was accustomed to using electronic devices frequently to play games, text, etc. 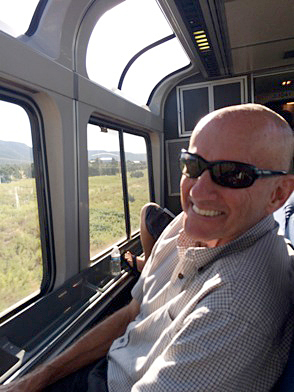 At the beginning of the trip, however, Johnny made the decision—on his own—to forego electronics throughout the trip, in order to fully appreciate his first long-distance train ride. Johnny accomplished his goal, which tells us a lot about how interesting an Amtrak trip can be for children. 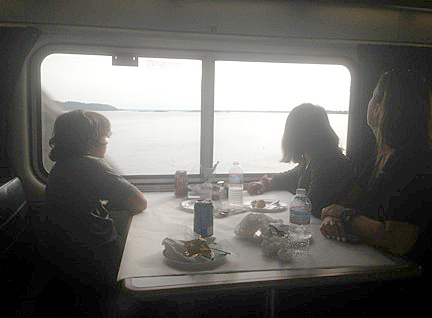 The kids were comfortable navigating their way to the sightseer lounge car, conveniently next to our sleeper, occasionally visiting the snack bar in the lower level. They enjoyed panoramic views from the upper level. So did I! As we entered Illinois, the conductor began making sugggestions for options for passengers who would be missing their connecting trains in Chicago. We tried not to look too smug about our previously made hotel reservations for an overnight stay in the Windy City. Lila Lee, noting that our delay would extend our arrival past dinner time, said, "I'm getting hungry," and asked me if we would have to miss the unscheduled meal, as we were six hours and forty minutes late. I had been on a very late train a few years previously, and recalled crackers and nuts being handed out. 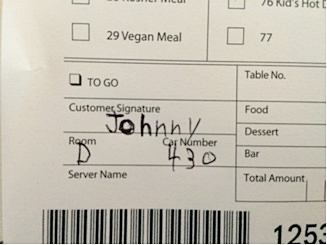 We were not surprised to discover that our very well-organized dining car staff had something better in store for us. Dinty Moore stew served over rice on paper plates was hot and nutritious! It immediately reminded daughter Anna of many of our family camping trips when she was a child. We detrained from Amtrak's eastbound Southwest Chief at Chicago, provided generous gratuities to our outstanding car attendant, and were met by Anna’s husband (familiar with Amtrak's late arrivals) who had flown to the city. Checked baggage arrived at the station carousel very quickly. We were soon on our way to the Hilton Palmer House Hotel. 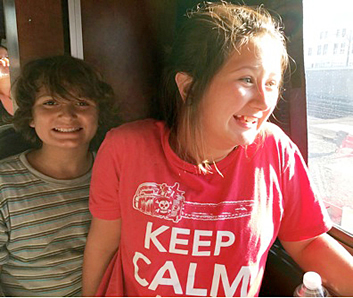 Amtrak provides special discounts for children. For details, call 1 800 USA RAIL, or one of the few travel agents who handle Amtrak trips.